A summary of sessions featured at our two-day invitation-only 2014 National Consumer Empowerment Conference in Chicago. 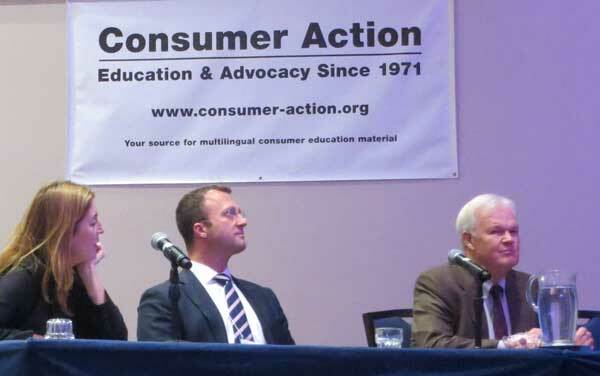 Now in its fifth year, the Consumer Action National Consumer Empowerment Conference is a hub for community activists who help individuals assert their consumer and privacy rights in the marketplace, avoid fraud and manage their money more effectively. Attendees heard about digital profiles and privacy from experts Ed Mierzwinski of U.S.PIRG, Seeta Peña Gangadharan of New America Foundation and Tiffany George of the Federal Trade Commission (FTC). The experts discussed the potential harms and opportunities of massive collection of information online and from connected devices (Big Data). The difficulty in knowing who is collecting and using personal data, particularly for underserved communities, was discussed, as was the lack of consumer control over sensitive personal information and how it may be used to discriminate against some consumers in the marketplace. Panelists spoke of the need for fair information practices, which include preventing personal information from being used in ways consumers would not expect. The panelists also pointed to the need to regulate data brokers, companies that collect, buy and sell our information without our knowledge or consent. The same consumer protections that apply to a lost or stolen debit card were recently proposed by the Consumer Financial Protection Bureau (CFPB) to be extended to general-purpose prepaid cards. Susan Weinstock of Pew Charitable Trusts detailed the CFPB proposal to limit consumer’s liability to $50 with “registered” prepaid cards, make fees clearer upfront and extend protections to cover peer-to-peer and electronic payments, like those made with Google Wallet or PayPal. Attendees also heard of alternative ways to access financial services. These included Walmart’s nearly no-fee Bluebird prepaid card, Bank of America’s Safe Balance checkless checking account and the U.S. Postal Service’s innovative plan to include banking services at post offices around the nation. San Francisco City Treasurer Jose Cisneros explained the city’s push for safer banking through direct deposit with its CurrenC SF campaign. A panel discussing bank alternatives included, from left, Angie Garcia Lathrop of Bank of America, Daniel Eckert of Walmart and David Williams, U.S. Postal Inspector. The second day featured warnings not to ignore communications from debt collectors, who are taking more consumers to court—even when they don’t have proof that the debt is owed—and winning default judgments when consumers don’t show up. Lisa Stifler of the Center for Responsible Lending (CRL) advised people to ask for proof of the debt and to dispute it with the collector within 30 days. The CFPB is expected to release preliminary debt collection rules in 2015. Corey Stone, an assistant director at the Bureau, told conference attendees that most consumers who complain to the CFPB about medical debts argue that the amount owed is wrong or the debt is not theirs. A large percentage of those with outstanding medical debts have no other overdue debts and no reason to be labeled as credit risks. (See “CFPB Watch” in this INSIDER issue.) In a separate session, the CFPB presented some of its latest tools, including Your Money, Your Goals, to help consumers better manage their money and debt. Fifty percent of car dealer profits come from car loans, and 80 percent of loans are made at the dealer, said Chris Kukla of CRL. “Dealer markups,” where car dealers tack extra interest onto a loan, are often higher for African Americans and Latino customers—even those who attempt to “negotiate” a better interest rate. The conference wrapped up with innovative approaches to saving families and communities from foreclosure. Advocates Trina Scordo (New Jersey Communities United) and Amy Schur (Alliance of Californians for Community Empowerment) explained how they are working in California and Newark, NJ to use eminent domain to return wealth to cities and communities. This involves eminent domain purchase by cities of failing, underwater mortgages at their current value and repackaging of the loans to affordable levels for homeowners. This also helps save blighted communities. During this session, an attendee from a community-based organization shared the group’s success in helping homeowners re-purchase their homes from mortgage securitizer Fannie Mae at an affordable rate. “That’s an outcome with far-too-rare results worth shouting about,” said Consumer Action’s Ruth Susswein. Consumer Action’s National Conference is free to invited attendees (including travel expenses) because of the generosity of conference sponsors: American Express, AT&T, Bank of America, Capital One, Chase, Citi, Comcast, Enterprise, Facebook, Google, Microsoft, MyWireless.org, TracFone, Verizon, Visa and Walmart. Representatives of many of the sponsors also attended the conference and shared important information with attendees.